Scientists have observed limited groups of Bottlenose Dolphins around the Australian Pacific using a basic tool. When searching for fish on the sea floor, many of these dolphins were seen tearing off pieces of sponge and wrapping them around their ‘bottle nose’ to prevent abrasions. Scientists at Georgetown University in Washington DC believe a single dolphin discovered the foraging technique by chance and then passed it on to her offspring. The foraging technique came to light a few decades ago – very recently in evolutionary terms – when a local fisherman spotted what looked like a strange tumour on a dolphin’s nose. Researchers eventually worked out that the ‘tumour’ was a conically shaped sponge and it became apparent that the dolphins would spend considerable time searching for one the right shape to fit their nose. The sponge is used to scatter the sand gently on the sea floor and disturb buried fish. 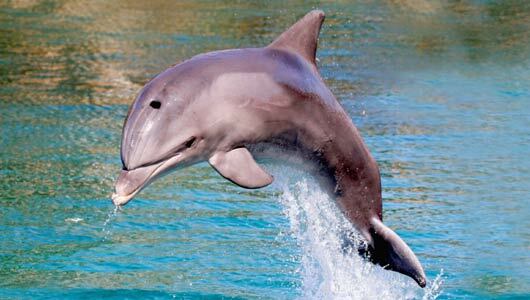 When a fish is spotted, the dolphin drops the sponge and gives chase. Scientists discovered that although dolphins tried to teach the hunting technique to all their young, it was mainly female offspring that grasped the concept. Why male offspring rarely acquire the same skill remains unclear, though the team put forward one possible explanation: male bottlenose dolphins tend to form close bonds with other males, and such alliances aren’t suited to seabed foraging, since it is a time-consuming, solitary activity. The US scientists say discovering a new tool is a direct sign of intelligence. “There’s a strong link between animals with larger brains and tool users. Bottlenose dolphins have a brain second in size only to humans.” said Janet Mann, a marine biologist who led the research. “Dolphins are already good at catching fish so they don’t need tools, but they’ve discovered this sponge makes their job easier. Working out how to use tools in a creative way like that is a hallmark of intelligence.” You can watch these clever marine mammals using this tool in the video below. Mann admits we still do not understand dolphins well. “It’s hard to get inside their heads because their brains are constructed differently and it’s very hard to analyse their language, but they do seem very intelligent,” she said. Dolphins are also often seen engaging in playful behaviour and create tools to use for entertainment. They have been observed blowing bubbles which they form into rings to play with. After creating the bubble ring, a dolphin will use its nose and body to maintain the shape of the bubble and keep it from floating to the surface.